Bro, as in everywhere belief, these ex-RJAF 13 F16 (OCU) aka F16 ADF at cheaper cost is a Great news for PAF. But right now they are not MLU as per ur suggestion, they have been done with structural engine upgrades etc to extend life to 8000 hrs. Since Israel's reservations, Jordan received the downgraded version of these F16s. The ex-RJAF which PAF is getting cannot fire AIM-9X Sidewinder Missile, or other more advanced missiles which a blk 40 or 52 standard can do. These F16s have previous version sniper pods, old camera system, and limited AMRAAM capability like the AIM-120C. The avionics and software system on the peace falcon II ex-RJAF is not updated. The EW (Electronic Warfare) system is not upgraded. Will the PAF be putting these through the same upgrade that is going on in Turkey to Block 50/52 standard? March 5, 2014: Pakistan recently bought 13 older F-16A fighters from Jordan. These F-16As had recently undergone a mid-life update and have, on average, 3,000 flight hours left. This increases the Pakistani F-16 fleet to 76 aircraft. This is far less than the Indian Su-30 fleet (over 200 and headed for 300 in the next few years), but every F-16 helps Pakistan in a potential air war with India. Meanwhile Jordan has also been buying Cold War surplus F-16s to update its own air force. Back in 2006 Jordan bought 20 Cold War F-16s from the Netherlands. Jordan already had 35 used F-16s (from the United States and the Netherlands.) Most of these aircraft are upgraded with late model radars and electronics. Jordan got all these aircraft at about a third the price of new aircraft. Even with the recent sale to Pakistan that still leaves 46 F-16Cs in the Jordanian air force. Pakistan also has a growing number of more modern F-16s. Back in 2012 they received three F-16 Block 52 fighters. These are all-weather aircraft that are particularly effective at night. These were the first all-weather fighters the Pakistani Air Force had received and another 15 of these aircraft were delivered by 2011. Pakistan had operated 40 F-16 since the 1990s, but was barred from buying any more after Pakistan revealed that it had nuclear weapons in 1998. That embargo was lifted in 2005 and another 14 F-16s were delivered by 2008. Pakistan also hired a Turkish firm to upgrade its older F-16s from Block 15 configuration to Block 40 (about halfway to the highest upgrade level for an F-16). Now that the U.S. has lifted its arms embargo on Pakistan, there are many firms competing for all the work needed to update older American weapons still used by Pakistan. The Turks have long had good trade relations with Pakistan, and have also developed, with the help of the U.S. and Israel, a growing aircraft maintenance and upgrade industry. Most of the F-16 work was be done in Pakistan using Turkish engineers and technicians supervising some local workers and using largely imported (from Turkey and elsewhere) components. Turkey has long maintained one the largest F-16 fleets outside of the United States. 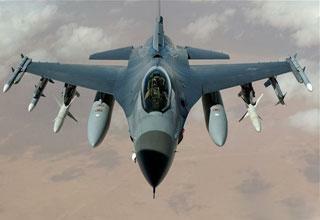 The F-16 is the most numerous post-Cold War jet fighter, with over 4,200 built, and still in production. During The Cold War, Russia built over 10,000 MiG-21s, and the U.S over 5,000 F-4s. Since the 1980s warplane production has plummeted about 90 percent. Yet since the end of the Cold War in 1991 the F-16 has been popular enough to keep the production lines going. The F-16 can also function as a bomber and ground attack aircraft, although not as effectively as the air force would have you believe. It can carry four tons of bombs. In air-to-air combat, it has shot down 69 aircraft so far, without losing anything to enemy warplanes. It was originally designed as a cheaper alternative to the heavier F-15. The two most advanced versions of the F-16 are in use by foreign air forces. The UAE has 80 "Desert Falcons" (the F-16E) which is optimized for air combat. It is a 22 ton aircraft based on the Block 52 model, but with an AESA (phased array) radar and lots of other additional goodies. Since 2008 Pakistani F-16s have been heavily used in the tribal territories, along the Afghan border, dropping smart and dumb bombs, and giving the pilots experience using targeting pods. This is the first combat experience the Pakistani F-16s have received and the Pakistanis are satisfied with F-16 performance as a bomber. This is a real good piece of info, all in all a good news for PAF. That above story is from strategypage.com, unreliable source and more famous for military humour. Pakistan and Jordan concluded a deal that will transfer 13 F-16 aircraft from Jordan to Pakistan. According to Pakistani sources, Pakistan’s Air Force has purchased one squadron of F-16 multi-role fighter aircraft from Jordan. The 13 F-16s were in service in the Royal Jordanian Air Force and will be inducted into the Pakistani air force next month. The deal has been finalized, approved by both countries, as well as the United States. 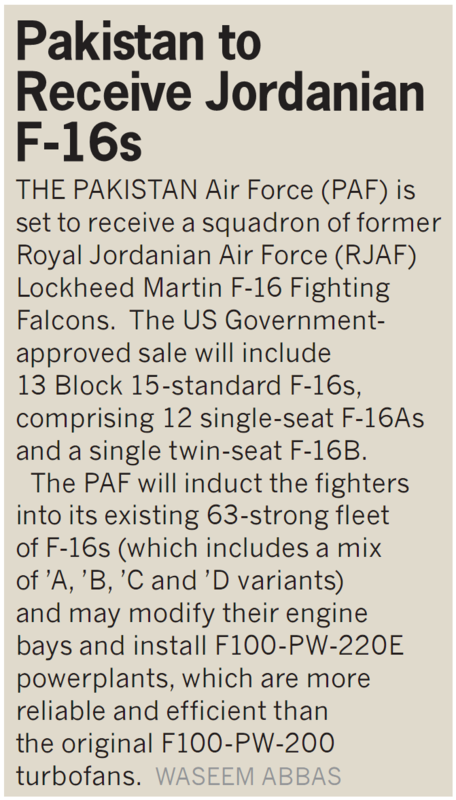 The 13 aircraft are the same F-16 A/B Block-15 variant that Pakistan’s Air Force already operates. The purchase brings the Pakistan Air Force’s total F-16 count to 76. According to Defense Industry Daily, the Royal Jordanian Air Force’s F-16 MLUs (Mid-Life Update) were bought from Belgium and the Netherlands. The set sold to Pakistan is from a separate set of F-16s in use by the Jordanian Air Force. “This set being sold is from the 33-plane Peace Falcon I/II purchases of F-16 ADFs in 1997 and 2003,” according to Defense Industry Daily. The ADF variant–ADF standing for Air Defense Fighter–is more suited for dogfighting, air superiority, and interception. The Pakistan Air Force (PAF) is close to concluding a deal for the purchase of up to 13 Lockheed Martin F-16 fighter aircraft currently flown by the Royal Jordanian Air Force, a senior Pakistani government official has told IHS Jane's . The official said the PAF has also made inquiries with at least two other countries to buy F-16s although he declined to name them. PAF officials have previously told IHS Jane's they were keen to increase the size of Pakistan's F-16 fleet, which currently comprises 18 F-16C/D Block 50/52 versions and between 45 and 50 F-16A/B models purchased in the 1980s. "The discussions with Jordan are at an advanced stage. We are looking at 12 F-16As and one F-16B Block 15 version, which will be upgraded in TAI" said the Pakistani official. "I hope a deal will come together soon and the aircraft could land in Pakistan in the next couple of months," he added. A senior Western diplomat in Islamabad said Jordan may have agreed to sell the aircraft after being persuaded by the United States and possibly Saudi Arabia. "Recently there has been speculation that the US and Saudi Arabia - for different reasons - are keen to boost Pakistan's potential given the coming events," he said in reference to increasing signs that the PAF could be deployed against Taliban targets in the semi-autonomous tribal areas along the Afghan border ahead of a Pakistan Army ground offensive. The United States has urged Pakistan's civil and military authorities to undertake this mission for years. At the same time, IHS Jane's recently reported that Saudi Arabia is seeking troops from Pakistan to boost its defences, especially along its southern border with Yemen. However, Riyadh's request has prompted speculation that Pakistan is being drawn into supporting Saudi Arabia in the event of the Syrian civil war spilling over into the kingdom. The PAF's long-term fast jet procurements involve the purchase of up to new 250 JF-17 Thunder fighter aircraft produced jointly by China's Chengdu Aerospace Corporation and the PAF-run Pakistan Aeronautical Complex at Kamra, north of Islamabad. However, Pakistani defence officials are keen to continue operating the F-16s as the backbone of the PAF, while also retaining the possibility of purchasing more US fighter aircraft if the country can afford them. Latest news is in a few months after MLUed and new engine upgrades PAF will receive 13 ex-RJAF F16s. Issue # 313 - Excerpt from Page 20. Only the engine upgrade is mentioned, no MLU? I believe the ex-jordanian F-16s have already had extensive upgrades carried out on them pre and post jordanian procurement. They are MLU since the IF antennas are part of the MLU, located aft of radar Radom. 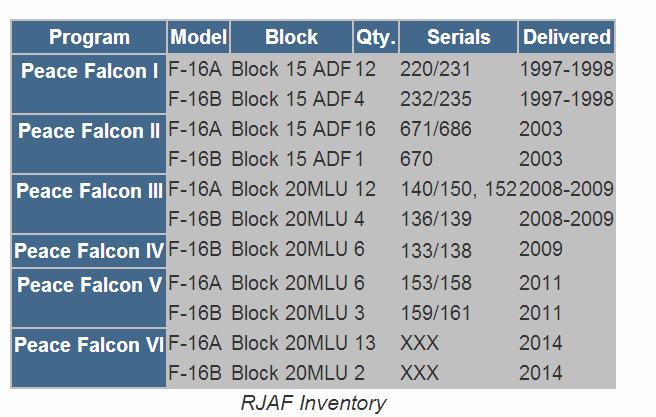 The airforce monthly above says these ex-RJAF 13 F16s are "block 15 standard" F16s, of version 13 As and 1Bs, no mention of MLU. My point of view is, that these aircraft will be used for Spare Parts! because we not have any news that PAF increasing the Squadrons, or in which squadron these aircraft injected. Secondly we still not inducting the Technology, we just inducting the Numbers, world reached almost to 5th generation of Aircrafts, and we are still emotional on inducting 3.5 generation aircraft in our inventory, keeping the fact that our Enemy inducting 4th Generation Air crafts, and signing deals for 5th Generation also. My another point is, JF-17 if good platform, but not capable for dealing 4 or 5 generation aircraft, because of two points, BVR capability still questionable and Payload. So now Because of JF-17 is under construction, infrastructure is on the roll, we have to start focusing on development on new Aircraft, because building Aircraft took 7 to 10 years for Development. What's questionable about the BVR capabilities of the JF17? The SD10 is standard issue with the Plaaf and the klj7 is a perfectly capable radar. Later blocks will come with AESA radars. 13 aircraft are maybe not enough for a PAF squadron. For the time being they are probably being allocated to existing squadrons, PAF will already have an F-16 shortfall since some of the F-16s from the existing fleet would be away getting their MLUs. Any F-16s are welcome no need for whining PAF has a huge fleet of aircraft to replace and they are very happy with how the JF-17 is coming along. No need to match India yet, their procurement plans are very delayed plus we need to build the economy for when we have good options available (J-31). The US wont block further F-16 acquisitions for units and spares as Pakistan will need good anti ground air power to keep Taliban in check once the US exits Afghanistan. I'm going to bet on the following. The PAF is now looking towards additional F-16s as replacements for their Mirage ROSE fleet and to supplant/replace its plans for FC-20. 1. It wouldn't surprise me if we see additional orders for used F-16A/Bs from the US and other sources (e.g. NATO), the PAF is probably looking to build its originally-planned (from late 1980s) 100-strong F-16A/B fleet (with a dozen or so additional spares as attrition replacements). 2. The PAF may exercise its option for 18 additional new Block-52+. Lockheed Martin will be producing F-16s for a couple more years, so there's still some room for another order and the PAF already has the requisite infrastructure for F-16C/Ds. It may also buy used C/D birds if available as EDA. I wouldn't count out the possibility of PAF ending up with 150+ F-16s (A/B/C/D). Edited by Saqr, 01 April 2014 - 01:30 AM. But aren't A/B's a bit too old in terms of air-frame? For how long will PAF will be able to fly them before they turn into Mirages? They can squeeze 10-15+ years out of them if they put the A/Bs through Falcon STAR. But if PAF acquires more A/Bs in the near future they'll be second hand......so probably they might have already been fatigued a bit I suppose. Even PAF admits that there is no better interceptor than the F-16. We have seen countries being pounded because they didn't have a good defence aircraft and their MIGs just sat on the tarmac burnt, Uganda, Iraq, Libya, Syria, Lebanon - I think that is the reason we want an air tight defence. I am fully on-board when it comes to F-16's, but PAF should set a minimum procurement standard of at least an MLU so that even if we procure the A/B's we can utilize them for at least 10-15 years more once in service. Don't want those basic A/B's turning into Mirages because either way we might be buying them second hand so the structural fatigue will be an issue. At the minimum the PAF will put all used F-16s through Falcon STAR (if possible), so as to gain 10-15+ years of flying life. As for MLU, it's likely given that the PAF isn't getting FC-20. That said, it would expect the PAF to pursue an AESA radar such as SABR for use on its F-16s. Edited by Saqr, 01 April 2014 - 04:03 PM. PLAAF is not interested in acquiring JF-17 (or Fc-1 as they call it China) - which is unfortunate because it means the unit cost of each JF-17 is much higher then it would otherwise be. If PLAAF is forced to buy it will be for political purposes. PLAAF would prefer J10 to be its soul future non stealth single engined fighter. We used to hear PAF acquiring 250 JF-17s but now only a figure of 150 is being mentioned. PAF already has the infrastructure for f16 and hence PAF could acquire potent fighter upgraded by Turkey. BVR is questionable because we still not witnessed any exercise with BVR Hits, F-16 also have Amaarms BVR missiles, but we not have these Amaarms yet! so the fact is we still lacking in BVR role, or first strike capability. According to my wisdom its very weaker side of our Air force, because our Pilots have to move very close to hit the enemy, and enemy have a capability to hit us with their BVR's, India have a capability of BVR's from 1970's. ^ My friend times have changed, and the change happened eons ago. Simulator and exercises are accurate to a point that a pilot can operate a jet immediately after simulator training. We have had multiple war games with US, Turkey, and China, to know what BVR is and what to do in war situations and dog fights. SARGODHA: Pakistan received on Sunday its first batch of F-16 fighter jets delivered from Jordan, DawnNews reported. Sources said that the Pakistan had signed a contract with Jordan for the supply of 13 fighter jets out of which five were delivered at the Mushaf Mir Airbase in Sargodha and inducted in the Pakistan Air Force (PAF) fleet. The inclusion of the 13 jets would take the strength of the PAF F-16s to 76. Media reports indicated the PAF had agreed to purchase an entire squadron from Jordan, consisting of 12 A models and one B model. According to one news report, the jets "were in good condition since they had attained Mid-Life Update (MLU) and they would be providing service for another 20 years with almost 3,000 hours on average available to them for flying." Bro on simulator , i shoot down 7 planes in 20 seconds! do u think this is possible in real life! from the pic it seems, 3-F16A and 2 F-16B which is strange as there is only 1 F-16B in the deal of 13. Computer games and professional simulators are not 100% the same. You're right, #3 and #5 are B.
Edited by Felicius, 28 April 2014 - 12:17 PM. And what it is gonna be bro? He's referring to the PAF's move to gather up as many used Mirage III and V frames as possible and maintain one of the largest (and eventually largest) Mirage III/V fleets in the world. It might be the same with the F-16s, i.e. gather up as many A, B, C and D airframes and build a sizable F-16 fleet, perhaps 100-150+. Edited by Saqr, 30 April 2014 - 12:32 AM. What Pakistan Air Force ought to do is establish a stockpile of parts which, at the least, would allow them to operate for 3 months in a war. At best, last them for 6 months in a war. If that is attainable, then it is justifiable to operate a fleet of 100 F-16s. Otherwise it is useless to an aircraft which already had a question mark hanging over it, regarding it's vulnerability of Americans giving Intel on the aircraft's parameters and detection. Another requisite for having F-16s is that Pakistan Air Force should be operating an combat aircraft fleet, which is equal to or greater than in capability to the F-16s. Also, they (fleet) should be operated in greater numbers to the F-16 fleet. And the best combat aircraft to fill this role is the J-10B. Which is the advance version of the J-10A. Boasting greater use of composite materials and Divertless Supersonic Intakes giving the J-10Bs stealth characteristics. Another major capability which the Pakistani F-16s do not have is the AESA radars. These capabilities combined with the fact that the aircraft is Chinese gives Pakistan Air Force an unparalleled advantage over the F-16s and the enemy. Who incidentally, has no access to Chinese technological capabilities.